Danny O'Brien produced his first winner of Melbourne Cup Week when Keep De Rose won the Visit Victoria Plate impressively in the first race on Oaks Day. O'Brien combined with Corey Brown to win with the filly, with the victory also being Brown's first for the week. "It's been a while, I've had a few placings and been thereabouts but it's good to kick off, especially at the start today and get a winner under the belt", Brown said. Always handy in second place during the run, Brown produced Keep De Rose ($10) at the 200m mark to go to the lead. She was untroubled to win by 1¾ lengths from Triquetra ($6.50), with a long neck to third placed Moreau ($5.50). Race favourite at $5.00, the previously unbeaten Gladius, ridden by Craig Williams finished last. O'Brien elected not to run Keep De Rose in the Crown Oaks after her unplaced run in the Ethereal Stakes on Caulfield Cup Day. "(The Oaks) was probably dependent on her last run but she got a bit lost from a wide barrier last start and couldn't really run up to what we needed to run in the Oaks so this is a bit of consolation today," O'Brien said. 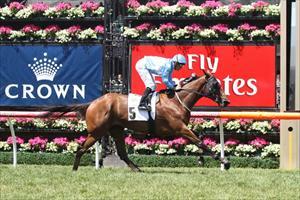 The Flemington trainer said pre-race plans were to make sure that Keep De Rose was on the pace. "We were always going to be a bit aggressive and make sure she got there and she probably overdid it a little bit so it probably made the win a bit more meritorious that she still found in the run to the line." Brown had to fight with the New Zealand bred daughter of Keeper during the race. "She was strong the whole way and if anything she was probably too strong early and she didn't want to come back to me", he said. O'Brien plans to send Keep De Rose for a spell now before preparing her for an Autumn campaign. "If we're going to aim her at some decent races in the autumn she probably needs to go for a break", O'Brien said. "She is only lightly raced, it's only her fourth start and both her win two starts ago and today have been very good so we'll hopefully get into an Oaks in the autumn." Brown agreed saying that the three-yea-old filly would only get better. "Next preparation she'll win more races and I reckon she'll probably get over a lot further." Purchased by Julian Blaxland's Blue Sky Thoroughbreds in New Zealand from Sir Patrick Hogan's Cambridge Stud, Keep De Rose is by Keeper from the Grosvenor mare, Grove Nymph.